Donors who contributed to the recently completed Reynolds Hall renovation project at Missouri Southern State University will be recognized during a special reception at 3 p.m. Friday, Sept. 15, on the building’s third floor. The event will include a welcome from Dr. Alan Marble, president of Missouri Southern. Dr. James Donelson, associate professor of chemistry, will speak on behalf of the faculty. Cole Corlett, senior biochemistry and chemistry major from Webb City, will address the donors on behalf the Missouri Southern student body. Reynolds Hall, MSSU’s science and mathematics building, was one of the first buildings constructed at the university in the late 1960s. An expansion in 1988 nearly doubled its size. The building is named for the late L.R. Reynolds, an original member of the Board of Trustees and Board of Regents. House Bill 19 provided $5.2 million for the project, while House Bill 17 contained an additional $1.5 million, which was matched by private contributions from alumni and other sources. 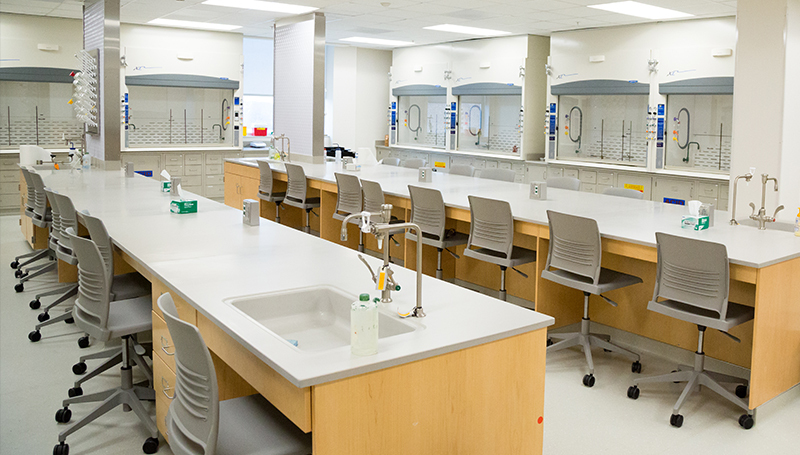 The recent renovations to the first floor included construction of tiered classrooms, biology labs and math classrooms, a student study room and computer area. Work on the third floor included chemical and physical science classes and labs, a tiered classroom and faculty offices. The project was completed in time for the start of the Fall 2017 semester. “State funding alone, while very much appreciated, wasn’t sufficient to complete this project to the extent we needed” said Kevin Greim, associate vice-president of Development at Missouri Southern. “So we turned to private donors. We now want to recognize the generosity of the people and foundations who helped us get this project across the finish line.